An owner of a co-op in Gramercy Park, Erica understands the intricacies of the New York real estate market better than most, and loves helping transmit this knowledge to her clients. Awarded "Rookie of the Year" honors at her previous firm, Erica's extensive knowledge of diverse New York City neighborhoods makes her an ideal agent for all of your needs. Erica knows how challenging renting or buying a home can be, and works to make the process both manageable and transparent. 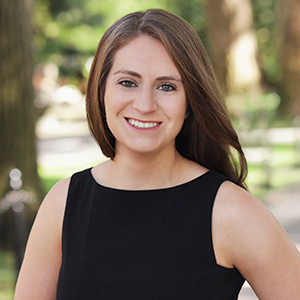 With a plethora of resources at her disposal, Erica works to connect her clients with the top lawyers, mortgage brokers, and movers in New York City, making their move as seamless as possible. Her business is centered on relationships, and Erica's clients know that in addition to finding them a new residence, she will be a resource to them in all aspects of moving to a new neighborhood. Her relationship with her clients doesn't end after moving day; rather, many of her clients have become lifelong friends. A native of New Jersey, Erica spent her whole life telling people that she was from "the city" and took every opportunity to explore it. Her extensive knowledge of diverse New York City neighborhoods, as well as the diverse New York City restaurant scene, makes her an ideal agent for all of your needs. A graduate of The University of Michigan (Go Blue!) and an avid New York Knicks fan, Erica spends her spare time watching sports, reading, and trying out every new restaurant. If you're thinking about renting, buying, or selling property in New York City, pick an agent that you can trust, and give Erica a call.